According to sources including the Telework Research Network and FlexJobs.com, remote work has boomed during the recession as job seekers look beyond traditional office-based gigs and companies embrace any opportunity to cut costs. That boom in nontraditional work, along with high levels of interest in entrepreneurship, has fed enthusiasm for coworking spaces. But will this enthusiasm outlast the tough economic times? Of course, no one knows how long the party will continue for coworking spaces. The trend has been fueled, in part, by an economy where corporate jobs for the young are scarce. A survey of coworking spaces by Emergent Research in 2010 found that their desks and sofas are mostly filled by well-educated male techies who are under 40, with 55% working for small companies and 44% of them freelancers or sole proprietors. But owners and managers of coworking spaces we spoke to think there are several good reasons a better business environment won’t put a damper on their movement. Noelle Stary, co-founder of Launchpad Creatives in New Jersey, for one, feels that the damage has been done and workers will no longer want to rely on big companies like they once did, even if the economy comes back. And Sam Rosen of The COOP in Chicago is also feeling confident that, while some very large spaces may face difficulties in boom times, his space can withstand an uptick in the economy. For one, it’s busier than it has every been, with interest also at an all time high. Plus, this interest doesn’t seem to be coming from economic desperation (or, at least at Rosen’s space, mainly from the Millennials Carter mentions in Fortune). The workers flooding the COOP aren’t driven their by financial necessity, Rosen reports, but by their desire for a better way to work. “According to the Global Coworking Survey 75 percent of coworkers have a college degree. The unemployment rate for college graduates is below 5 percent, far from the national average. Coworkers are also younger, under 40, and very comfortable with technology,” Baute points out, proving that coworking’s core demographic isn’t the one most affected by recession. What do you think the fate of coworking spaces will be when the economy finally heats up again? Image courtesy of Flickr user jonny goldstein. The Fortune piece raises a good question. Is coworking a purely opportunistic business model and at risk should the economy improve? It’s fair to say that a good number of coworking spaces are being run more as hobbies than businesses, thanks to an abundance of newly minted independent workers as well as depressed real estate prices. Disclosure: I run two coworking spaces in Minnesota. If new freelancers and cheap rent were all that we had going for us, we’d be in trouble. We definitely view ourselves as a business. We pay market rates so that we can be in the right space and we charge a premium for our memberships because we believe they deliver value. As a result, we don’t have too many economic refugees as members. Rather, we have people who are committed entrepreneurs, veteran freelancers with many years in the game, as well as corporate nomads who have “jobs” but have the freedom to work where they choose. If this last segment keeps growing (fueled perhaps by more companies embracing telecommuting as they compress their real estate holdings) then the demand for coworking may not necessarily be dampened by an economic upturn. But will there be a classic upturn with return to business and hiring and officing as usual? That is a big question mark in my mind. Definitely agree with Sam Rosen’s point that coworking is an option for people looking for a better way to work– and that desire for change will weather any economic downturn and boom. 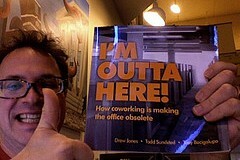 I think coworking spaces are here to stay! Whoops, missed the photo credit at the bottom. Didn’t mean to hate! Whoops on the whoops, should have read below before I replied but glad all is sorted. Hi, that’s my photo at the top. It’s licensed with a Creative Commons-Attribution License. That means you may us it, but only if you give me attribution (i.e. a photo credit). So, use my photo all you want, but please give me attribution. Thanks! There’s a credit at the bottom of the post that links to your Flickr page: Image courtesy of Flickr user jonny goldstein. If you prefer another format just reply and I’ll change it. Thanks for the great image. (feel free to delete this comment, I couldn’t find any way to contact the author). You’re right, Duncan, thanks for the heads-up! It’s been fixed. With the price of gas what it is today, it gets harder and harder to commute to a traditional office job. There are so many aspects of an office environment I miss (and so many I don’t miss). The advantage of Coworking in a rural community is that the desk jobs aren’t here. And most people don’t want to be a slave to a corporation, when they can be a successful entrepreneur and achieve a healthier work/live balance.